How to Throw an Impromptu Bunny Bash. I stayed up a little too late one night and got the crazy idea to throw an Easter egg hunt the following weekend. We’re heading to Europe Easter week and if we were ever going to have an egg hunt, it was the best weekend in March for us. Given the time constraints (9 days), I wanted to be as simple as I could (or I know how to be). Simple generally means balloons and streamers as my go-tos, but I wanted to come up with a creative way to use them. I have a balloon air pump, so I decided to blow up tons of balloons (all from Party City) to lay around the floor. They give off the giant easter egg vibe, especially in the multitude of colors. With the streamers, I layered them over the dining table and across the ceiling to create a scallop effect. I added a DIY paper flower garland to give it some extra oomph (paper flower tutorials here and here). Going in to this, I knew I wanted to bake mini cakes for the girls. Enter —> DIY bunny cake bar! Each little lady would have her own mini cake to decorate into a bunny. Instead of a table setting, I opted to line the center of the table with cake stands. I had them all on hand already (but you can find similar ones here, here, and here). The cake stands served as the supply station for the DIY cake bar. I bought several kinds of sprinkles, candies, gel icing tubes, and edible markers. I rolled out pre-bought gum paste and cut/shaped them into bunny ears. 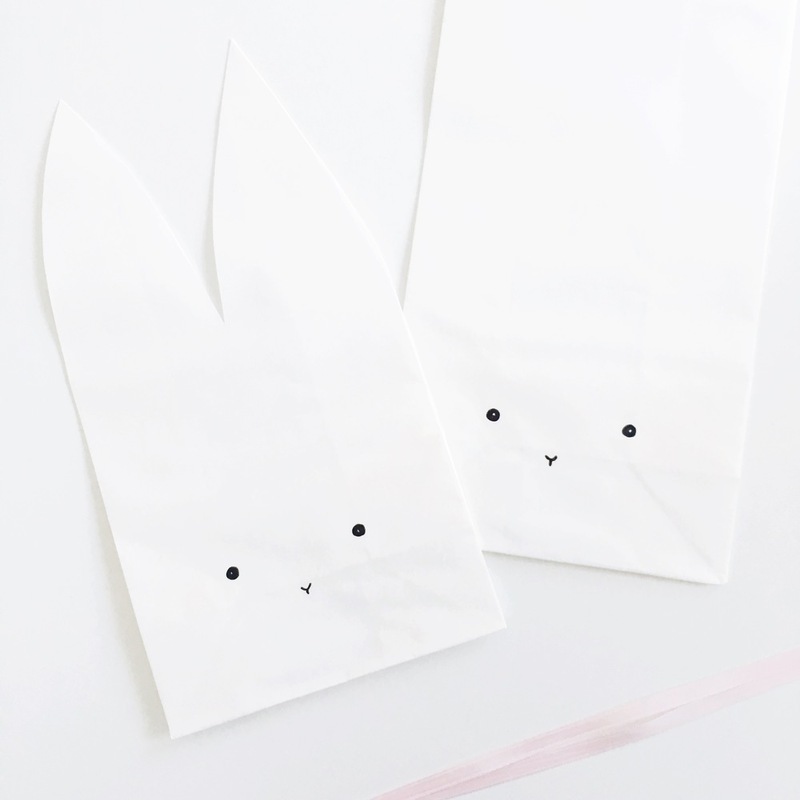 For the bunny favor bags, I tried to use this DIY found on Pinterest, but I could not, for the life of me, figure out how to make it look that good (the original is from confettisunshine.com but her website isn't working right now). I changed things around a bit with my cut so that the bag would stop crumpling on me. The paper bag I used from Michael's kept ripping too (it was on the delicate stiff side). 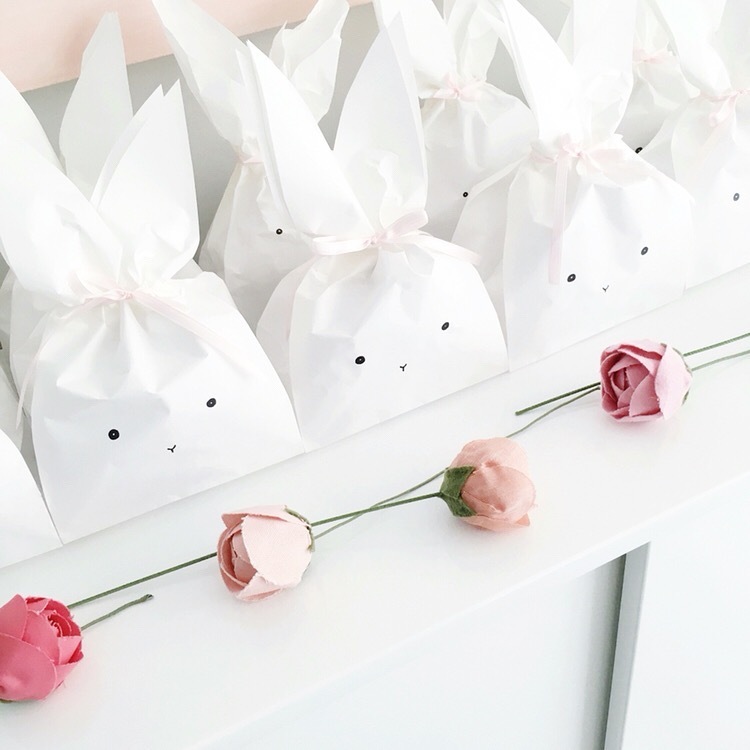 I made a bunny crown for each guest to wear (more on shophaha). I displayed them on a pin board (here). To make their name banners, I used this tutorial from Pinterest. We kept all of our eggs from last year, so all we had to do was fill them up with goodies. I purchased baskets for each guest (these). Next year, I might decorate the yard with free printables (here and here) and plan a few games.. maybe even a relay race (think potato sack races and eggs on spoons). 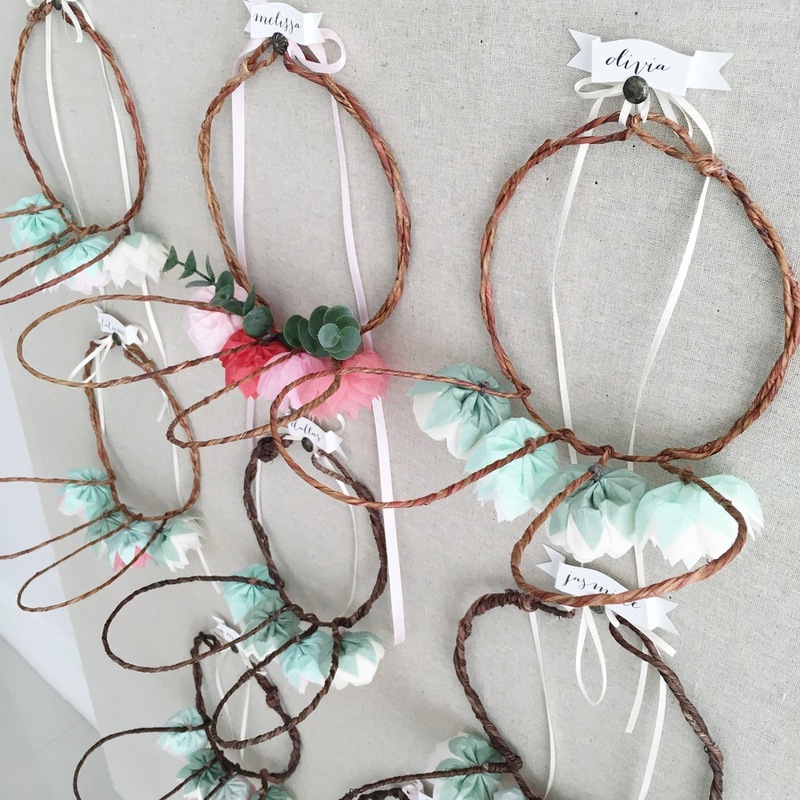 DIY: Hanging Floral Garland (Kinda).